School dances are an important component of a student’s experience during his or her middle school and high school years. Village Glen provides students with an opportunity to interact socially in an age-typical event in an atmosphere that is safe and nurturing. There are three regularly-scheduled school dances during the school year – October/November, February, and May. The dances are held in the evening, and feature a DJ who is familiar with our population and knowledgeable about current songs and their appropriateness for a school function. Drinks, pizza, dessert, and snacks are served and every student attending receives at least one small prize for participation. School staff volunteer their time and attend the dances in order to offer support, facilitate social interaction, and provide supervision. Parents and siblings are also welcome to attend. 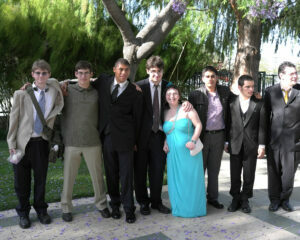 There is also a Junior/Senior Prom—typically held off-campus—and an on-campus Winter Formal. High School students raise money throughout the year to fund these important milestone events.